Tamra Lynn "Tammy" Youngblood, age 54 of Talbott, passed away Saturday, Jan. 26, 2019 at Morristown Hamblen Healthcare System. Tammy was a member of the Cedar Hill Church of God. She was preceded in death by her grandparents: J.B. and Maxine Youngblood, and L.A. and Ruth Wolf. She leaves her parents: Rev. Samuel and Mary Ruth Youngblood, brothers: Rick, Artie (Shelia), James, and Jesse (Melissa) Youngblood and sister: Melody Youngblood (Clinton) Walker. 6 nieces and nephews, 7 great nieces and nephews along with several aunts, uncles and cousins. The family would like to say a special thank you to Ann Ratliff and the Staff of Life Care Center for all of the wonderful care they provided. Funeral services will be 7:00 PM, Sunday, January 27, 2019 at Cedar Hill Church of God with Rev. Joe Cole officiating. Visitation with the family will be from 5:00 PM until services commence at the church on Sunday. Interment will be in Resthaven Cemetery in Corbin, KY. 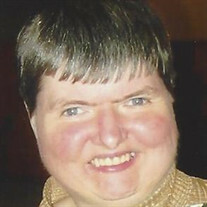 In lieu of flowers donations in her memory may be made to either Cedar Hill Church of God, 7066 Cedar Hill Church Road, Talbott, 37877 or Special Olympics, both that were dear to Tammy.